Having eaten gluten up until 7 years ago, the only peril at the extended family Thanksgiving prior was dodging the ‘orange juice potatoes’ (what I thought the sweet potatoes with marshmallows were). It was not until I became gluten free, as well did my young children, that I realized all that is woven through a food-based holiday intending to be inclusive. When you have a dietary restriction it’s almost impossible not to feel left out. The first Thanksgiving I hosted after becoming gluten free, I’d been gluten free about 4 months and my children about one month. We were folding in friends and extended family, everyone bringing their own favorites as we always had encouraged. I was sure the core foods would be gluten free since we were making them and felt anything that might arrive with gluten would not be a big deal in that we’d just avoid it. It was my first experience of feeling excluded from food, not by any intention but more from watching my children’s stark, silent response to billowing whipped cream piled high on pies (we were initially dairy free too), and buttery, steamy dinner rolls that were off limits. I had not anticipated it, feeling our bases were covered but the sting of the exclusion caught my attention on this holiday in particular, one historically originating from a group coming together to share in a feast. Having been able to eat everything I might choose before becoming gluten free, being excluded by food was a new experience. The irony was not lost on me that the very substance that is earmarked to bring people together was casting me as an outsider. I don’t think it is an experience one could quite conjure if not in the situation. Whenever at a meal not prepared at home, a gluten free diner is always removed a bit from other diners and must be on guard at all times to artfully navigate food, make substitutions, query ingredients to ensure safe eating, all the while hoping not to offend a restaurant staff or home cook. After our Thanksgiving experience we vowed to make our own Thanksgiving meal and ensure all dishes being contributed could be eaten by all diners. That included other guests who might have additional restrictions. Fortunately the Thanksgiving mainstays are either gluten free naturally or become so with small tweaks (using gluten free cornbread for stuffing for instance), and no one is the wiser nor is the quality of the dish compromised. As a primer, gluten is a binder. It is a protein in wheat, barley and rye with an implication to oats due to their growing methods. Gluten free oats are available for purchase. For those unable to process gluten physically due to Celiac Disease or gluten intolerance it presents essentially a condition of malnutrition causing the nutrient-absorbing villi in the intestines to lay flat when gluten is in the system, thus not pulling nutrients from the digesting food. It’s effect can take many forms from gastro-digestive ‘distress’ to slowed physical growth, severe fatigue and many more symptoms. (Here is a great guide ‘Gluten free cheat sheet’ and lots of recipes too). When planning a meal if you are gluten free or including gluten free guests the guidelines are fairly simple. Whole foods are always safe; fruits, vegetables, meats. If using processed foods always read all the ingredients ensuring you know what they are. Bread and pasta must be made with non-gluten flours, which are abundantly available and well labeled. Beware of sauces, again reading the ingredients, as wheat can be added for thickening or things like soy sauce which has gluten may be included. Fortunately with the beauty of the World Wide Web, the amount of information, communication forums and fabulous recipes are endless. In anticipation of Thanksgiving I’ve assembled a selection of gluten free recipes both of my own and those from bloggers I love. Some of the bloggers are exclusively gluten free and others include gluten free recipes all well marked. I think you’ll agree their photography makes it worth a look at their blogs and you may find some new favorite ‘reads’. I also think you’ll agree the recipes sound delicious and something all gluten AND gluten-free diners will love. 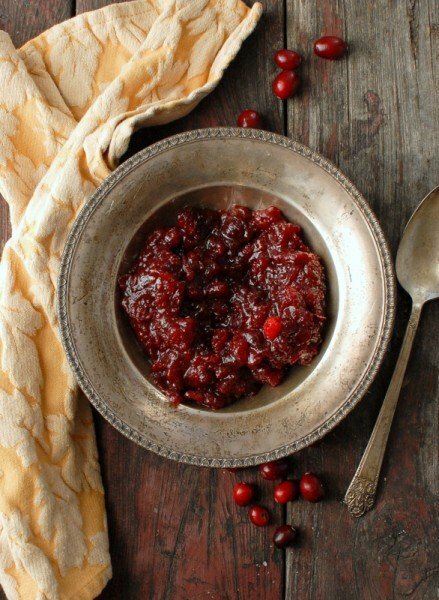 One of my favorite things to make for Thanksgiving is Cranberry Sauce. It’s simple, quick and I always make it from scratch. 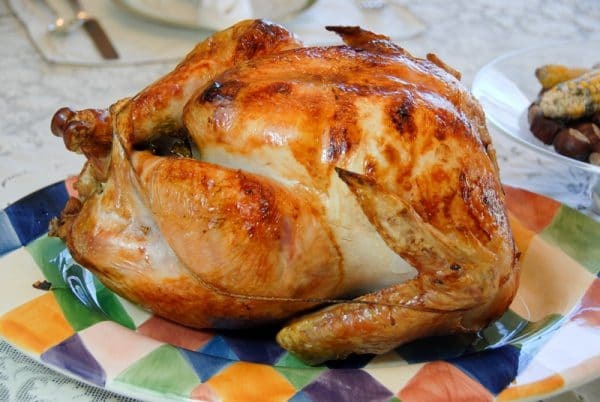 This favorite recipe dates back to when I first began to cook for Thanksgiving in college. It’s been iterated several times with this version featuring a touch of the Southwest using Red Chile Honey. 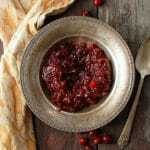 This cranberry sauce has the traditional flavors only made a bit feisty with some red chile honey. I used a brand I purchased when in New Mexico but noted several recipes on the web for making it oneself. My version has additional herbs and garlic which work great with the cranberries to give the sauce a full bodied and balanced flavor. Bring the honeys and water to a boil. Add the cranberries and bring back to a boil, stirring periodically. Boil on medium-low for about 10 minutes until the berries have burst and the sauce has thickened. Allow to sit for 10 minutes. Serve warm or chilled. Total time includes the sauce resting for 10 minutes. Recipe can be doubled or tripled; adjust cooking time accordingly. 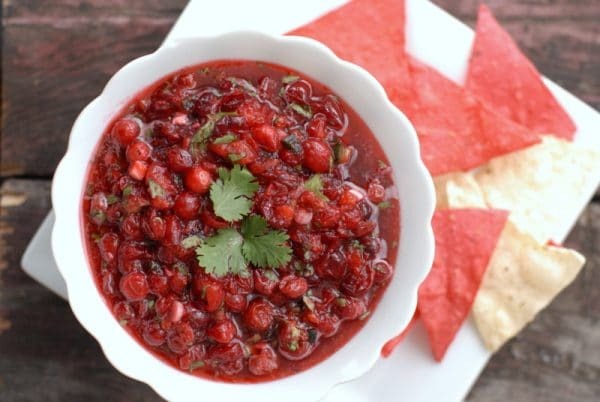 This untraditional, seasonal salsa is perfect for noshing during the day while waiting for the Thanksgiving feast! Despite this not being a traditional Thanksgiving pie, it is a family favorite that has woven it’s way onto our annual menu. The cool mint seems a welcome relief at the end of a filling meal! 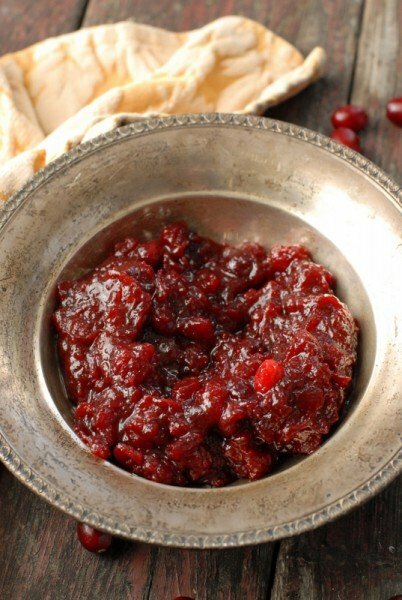 Filed Under: Gluten Free Living, Holiday, Side Dishes, Thanksgiving Tagged With: gluten free desserts, gluten free experience, gluten free primer, gluten free side dishes, gluten free Thanksgiving, spicy honey cranberry sauce recipe, Thanksgiving food, what is gluten? 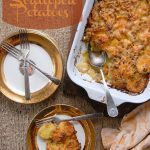 Green Chile Scalloped Potatoes: a Sassy Thanksgiving Side Dish! 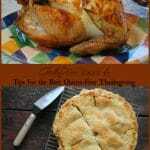 I love this meal especially the pie.. I love challenges like these. Instead of viewing them as obstacles, true chefs view dietary restrictions as creative problems! Great post, Toni. Hi Viviane! I am a bit of a Nike-minded person adopting the ‘Just Do It’ approach. Fortunately we live in the era we do and there is alot of gluten awareness and products available. Of course the whole foods recipes are the best…..whether gluten free or not! Jenn you are so welcome! Thanks for your unending parade of thoughtful, delicious recipes and photographs from which to choose! We eat gluten, but I have friends who are allergic so I’m often thinking about gluten-free recipes. It’s not that hard to adapt, but you do have to be deliberate about checking packaged goods in particular to make sure gluten isn’t sneaking in. 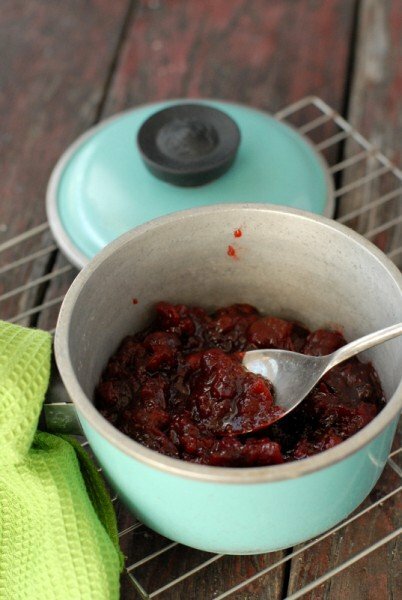 Nice cranberry sauce – I love to spice mine up too. I don’t think I’ve ever seen Red Chile Honey – I’ll have to look for that. 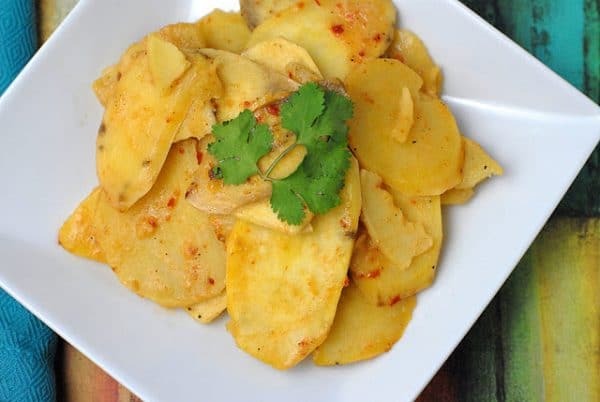 Love the idea of spicy honey! Good stuff – thanks. Diligence is the name of the game with gluten for we who cannot eat it. At this stage it’s very easy to navigate but I’m still surprised to find wheat in rotisserie chicken from a store or other unsuspecting things like that. Always need to stay on my toes! You can find Red Chile Honey online John. It’s much more fun to buy it in Santa Fe but if one doesn’t have the time for that trip, cyber space is the next best thing. Let me know if you want some links. I love your photos!! They are so beautiful. 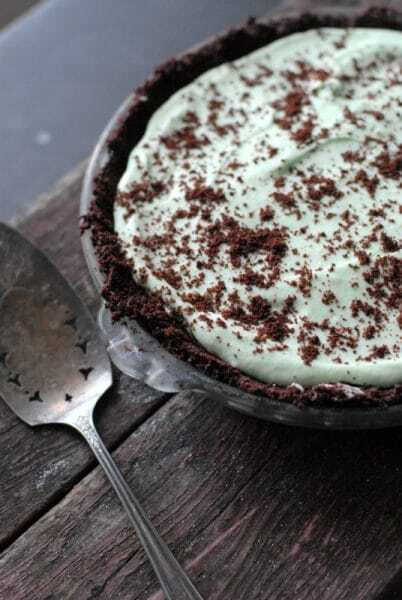 Your grasshopper pie recipe is the best! I make it for my family all the time. It is a favorite in my family. Loved by all!!! 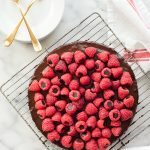 Thank you so much for taking so much of your time to create wonderful recipes for your readers. Thanks for being awesome!! Thank you Grace for your kind comment and I’m so glad to hear your family loves Grasshopper Pie as much as mine does! Your comment made my day. Thank you for reading!